The book was the first of the pictorials from Classic Warship Publishing that dealt with ships from a foreign navy. The Kongo class were designed for the Japanese Navy in England, and the lead ship of the class was built by Vickers Armstrong Shipyards. Japanese naval officers were on hand to witness the construction of their new ship – which started life as a battlecruiser – and also the construction of the British battlecruiser Princess Royal. Armed with this knowledge, the remaining ships were built in Japan, starting with the Hiei. When launched, the Kongo class battlecruisers were the most powerful in the world. The British actually built the HMS Tiger as their own version of these ships. The design also influenced the design of the Repulse and Hood. In line with previous books, the pictorial is laid out in four sections – one for each ship. There is brief “General History” of the class, followed by “Record of Movement” of each ship. 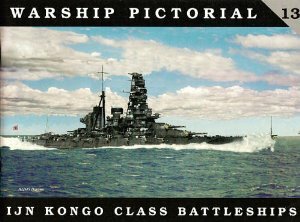 With the destructon of so many Japanese records (and pictures) during the war, Classic Warships has done a nice job outlining the history of the ships and coming up with good pictures. Three of the four battlecruisers were modernized in the 1920’s, while Hiei was de-militarized to avoid scrapping. The Japanese carefully hid the armor and armament for her, and when war clouds began to gather in the late 30’s she was secretly rebuilt. Hiei’s three sisters were all reconstructed again in the 1930’s, from which they emerged with their distinctive ‘pagoda’ superstructure, longer hulls and new propulsion systems. All four ships saw extensive action during the war. After participating in the hunt for Force Z in 1941, seeing action in the Solomons and later surviving the Battle of Leyte Gulf, Kongo was sunk in November 1944 by the U.S. submarine Sealion II. Haruna also participated in the hunt for Force Z, bombarded Henderson field and fought in the Battle off Samar, finally being sunk by U.S. Naval aircraft in July 1945. Hiei and Kirishma were both attached as escorts to the Pearl Harbor and Midway strike forces. As part of Battleship Division 11, both were involved in the action around Guadalcanal, where they were part of the bombardment force that was tasked with eliminating American airpower at Henderson field on November 12, 1942. Intercepted by a U.S. Navy cruiser/destroyer force in the early hours of November 13th, a wild night action ensued. Hiei was seriously damaged in the point blank fighting, and after being punished by repeated attacks by the Cactus Air Force, she was scuttled. Kirishima returned down the Slot the night of November 14th to finish off Henderson field, only to be intercepted by the battleships South Dakota and Washington. In another confused night action, the South Dakota – which had lost power – was silhouetted by burning U.S. destroyers and pummeled by Kirishima, who was in turned stalked by Washington. At point blank (for battleships) range Washington opened fire, knocking out two of Kirishima’s main turrets, wrecking her steering and holing her at the waterline. On fire and adrift, she sank the early the next morning. Classic Warship has been able to put together a very good pictorial history of these ships, from early history and through reconstruction and into the early part of World War II. The pictures are accompanied by line drawings of the ships in different fits. Some of the more interesting pictures are one’s where Wiper has either spliced together separate shots to give overall views of a ship, or enlarged sections of pictures to reveal details not readily noticeable. For anyone building any of the new 1/350 kits of this class – or even the old Yankee Modelworks or 1/700 waterline kits, I highly recommend this book for your reference library.